PRS all out for Nogeh too in P192 MAS GADING.?? He also said BN will be weakened if our machineries don’t work together as one. The opposition would take advantage and capitalise on this. It does appear that the message has slowly filtered down to the ground and the MAS Gading constituency is now awaiting only PRS to declare their full support to the candidacy of Anthony Nogeh. The 1BN spirit should be fully capitalised in not only the 31 Sarawak constituencies but in the remaining 191 Parliamentary seats. If most of the “saboteurs’ or “traitors” are removed BN would not have too much of a problem in being returned as the ruling coalition to govern the country from 2013-2018. The BN Supreme Council have already put the motion in order and it’s now up to the divisions and branches to follow through to show the true spirit of 1BN. BAU: The SPDP recommended candidate for Mas Gading, Anthony Nogeh Gumbek, received another morale booster after SUPP Bau branch announced the formation of an election campaign committee to assist him in winning the constituency. SUPP Bau branch chief Chong Bui Ling said the branch will only throw its support behind Nogeh despite talks the incumbent MP Datuk Dr Tiki Lafe was interested to contest as a BN direct candidate. “We will only support the candidate from SPDP. We will not support any other person, organisation or club who want to contest here,” he told reporters after the branch’s Chap Goh Meh gathering at a restaurant here Tuesday night. 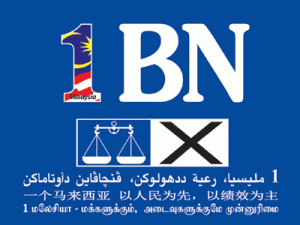 The pledge of support by SUPP Bau came just a few days after another BN component, PBB branches of Tasik Biru and Opar, announced their full support for Nogeh and formed their respective election operation centres to assist SPDP. Nogeh, who has hit the trail in the constituency since his name was revealed, was also present at the gathering where he was warmly received by members of SUPP Bau branch. On a related matter, Chong said SUPP Bau believed that a new member of parliament for Mas Gading would bring the much needed economic boost to Bau town. He claimed that Dr Tiki, in his 15 years as the MP, had not been effective enough in implementing programmes which could spur the local economy and this had been a concern among the business community here. “Our stand is very strong. Even though we appreciate the services and contributions made by Dr Tiki, we strongly think it is time for change. “We want a new face, and we have full confidence in Anthony Nogeh as the best person to represent the constituency,” he said. Speaking on behalf of the business community here, he said they hoped Nogeh would assist them in realising the setting up of CIQ facilities at the border post of Serikin to facilitate cross-border trade with neighbouring Indonesia. He said this has been the aspiration of the business community here as they want to forge better trade relations with their counterparts in the Indonesian towns of Bengkayang, Singkawang, Sambas and Pontianak. “The towns of Bengkayang and Singkawang are closest to Bau. Imagine if there are proper facilities at Serikin, there will be bigger volume of business and this will benefit everyone. The people from Indonesia will also come to Bau to shop and visit places of interests, and this will boost the local economy and tourism. “For us the business community in Bau, the present CIQ complex in Biawak is too far for us because we have to drive about two hours just to get there,” he said. Meanwhile, Nogeh in his remarks said he appreciated the pledge of support and assistance rendered by other BN components in Mas Gading. “This is in line with the BN spirit of comradeship and solidarity, which is vital towards achieving victory,” he said. He also thanked the community leaders who have been supporting him, and he pledged to do his best and work with all the communities in Mas Gading if elected as the MP. Tiki’s days are numbered. Of course, he is still the incumbent MP but he has been sacked from the party SPDP. 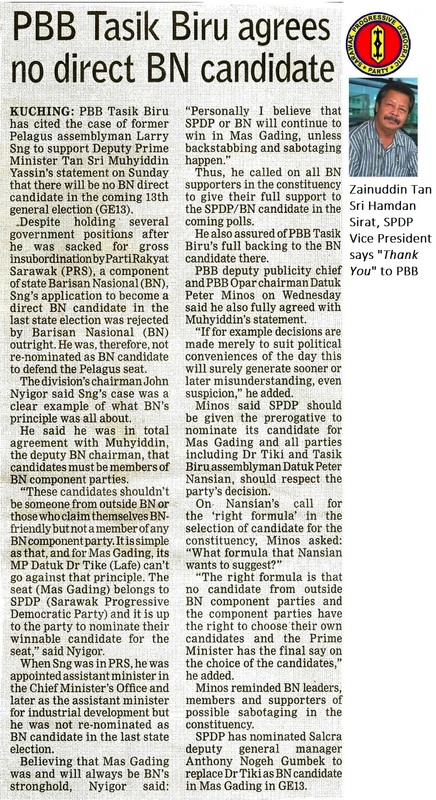 By virtue of the Sarawak BN coalition understanding the party SPDP will lay claim to the seat. The MP/YB can leave or be sacked by the party but the seat remains the party’s. This was reemphasised to me by a strong supporter of BN/SPDP whose family are mostly voters for the constituency. BAU: Parti Pesaka Bumiputera Bersatu (PBB) branches in Mas Gading have cast doubts over the winning chances of incumbent member of parliament Datuk Dr Tiki Lafe if he were to defend his seat in the coming general election. The chairmen of the party’s Opar and Tasik Biru branches Datuk Peter Minos and John Nyigor respectively said Dr Tiki would find it very difficult to win again following political events affecting him. They believed the new face recommended by Sarawak Progressive Democratic Party (SPDP) namely Anthony Nogeh Gumbek was the best person to represent Barisan Nasional (BN) to defend the Mas Gading seat in the coming general election. They stated their stand in response to the reluctance by Prime Minister and BN chairman Datuk Seri Najib Tun Razak to rule out the possibility of fielding direct BN candidates in the general election when asked by reporters during his recent visit to the state. Minos, who is also PBB deputy information chief, said there is no doubt that Nogeh would be the BN candidate if the BN principle and constitution are adhered to. “To our BN friends in Mas Gading, do not worry about PBB. We will help each other to ensure victory,” he said, adding both PBB Opar and PBB Tasik Biru have set up operations rooms at Kampung Stuum Muda and Bau town respectively to assist SPDP. Minos added that the chances of Dr Tiki winning was dented after being dropped from the federal deputy minister’s post in 2008 and his sacking from SPDP in 2011. “He has been going around saying he is still winnable candidate. That is just his propaganda. “Just think of the reasons why he was dropped from the federal cabinet and why he was sacked from his own party. Do you still think he is winnable? He is not,” he told a gathering at the house of SPDP Tasik Biru vice chairman Majen Minos at Kampung Grogo near here, last Saturday night. John who also spoke disputed Dr Tiki’s claim that he is winnable candidate, pointing out that the candidate representing BN must have support of all the four BN components in Mas Gading. He claimed that Dr Tiki had not been appreciative and reciprocal to the support rendered by PBB in assisting him in the past three elections. “If he thinks he is winnable, why not stand as independent to prove it? 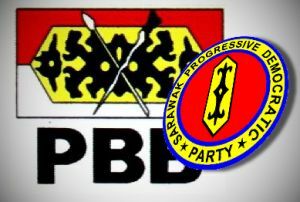 As far as PBB Tasik Biru is concerned, we respect SPDP’s decision to field Anthony Nogeh as the candidate and we will help him to win by big majority,” he said. Also present at the gathering were SPDP vice president Rayan Narong, SPDP supreme council member Michael Sitien and Nogeh himself. 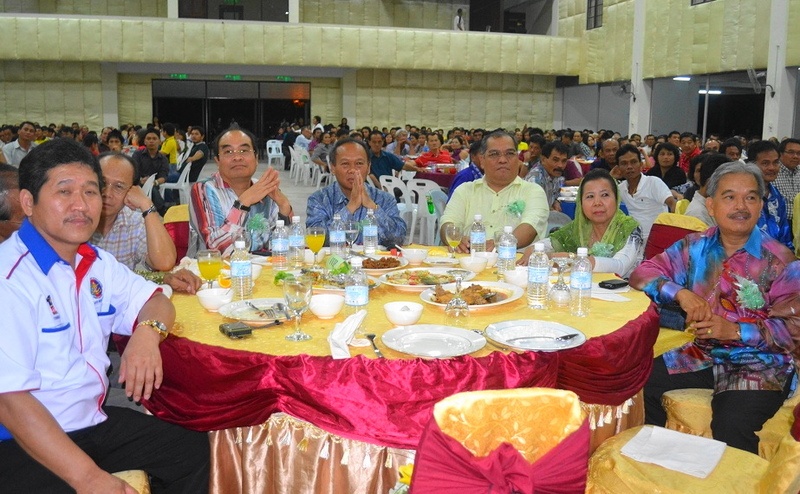 Nogeh, who is the Sarawak Land Consolidation and Rehabilitation Authority (Salcra) deputy general manager, thanked those who assisted him in the past one year covering the ground and pledged to do his best for the constituency. P192 “G5 Will Not Give Up..!!”. No Matter what Happens the G5 will not Give Up until the GE13. An sms has now gone viral and it has caught the attention of certain concerned grassroot leaders in SPDP.Eventhough DPM Muhyddin has made it clear that only BN component party members will be selected to represent BN the “sacked incumbent MP” and his allies have not given up hope. There seems to be a twist to their actions as they are hell bent to “reveal all if their intentions” are not met. The 2 sms received,’ Is there any truth to this..?? Yesterday Nansian,tiki group meeting community leaderrs at Kampung sua they formed a group of 10 in every kampung and each of the member were given RM1000 to move and convince people that Tiki will still be the Bn candidate. Today talks is that Nansian and Tiki are also planning a day event on February16th to hijack community leaders away from SPDP night dinner function. 2.Ask him whether he meant it or just a rhetoric to please the crowd present? 3.If it is ask him to issue a Press Statement and have it published. PBB leaders in the( P192) MAS GADING Parliamentary Constituency have been coming out strongly accepting the facts and throwing their support to Anthony Nogeh who has been chosen as SPDP candidate. All negative feedbacks must be dealt accordingly and swiflty to ensure the party maintains a comfortable grip on the situation. The earlier the candidate believes that KNOWLEDGE IS POWER the brighter his outlook is. If he still thinks he can just waltzed through he will be in for a RUDE AWAKENING. BN hopeful P192 Candidate has to thank the party and its loyal members for the undivided stand in supporting him to be on the party ticket to represent BN in the upcoming General Elections. Of course Tiki Lafe and the so-called BNClub members will go all out to lobby till the last minute to ensure he stands a chance to be renominated. PBB deputy information chief Peter Minos has thrown its weight behind SPDP’s choice. This was his the statement,” it was public knowledge that SPDP had decided that Nogeh would be its candidate for Mas Gading and that they in PBB would respect that decision. Anthony Nogeh would on Nomination day be thankful and say,”ALL BECAUSE OF YOU SPDP”.. This will be a new chapter for the party.